Leonardo Pietrasanta, David Hasler, Dominik Obrist. ARTORG Center for Biomedical Engineering Research, University of Bern, Switzerland. OBJECTIVE: Turbulent flow is detrimental to long-term outcomes of Transcatheter Aortic Valves (TAVs) prostheses because it can lead to increased trans-valvular pressure gradients, shear-induced thrombocyte activation and adverse aortic events due to unphysiological mechanical stimulation of the endothelium. This study investigates how the Implantation Height (IH) of TAV affects the intensity of turbulent flow in the ascending aorta. METHODS: Volumetric flow measurement in the aortic root was performed in a pulsatile flow loop using a multi-view imaging system for tomographic PIV. A self-expandable TAV was inserted in a silicone phantom mimicking the aortic root. The lower limit of the TAV stent was placed at three different IH (10, 7 and 4 mm below the aortic annulus). The turbulent flow field past the TAV was measured and statistically analysed for mean flow components and turbulent fluctuations. 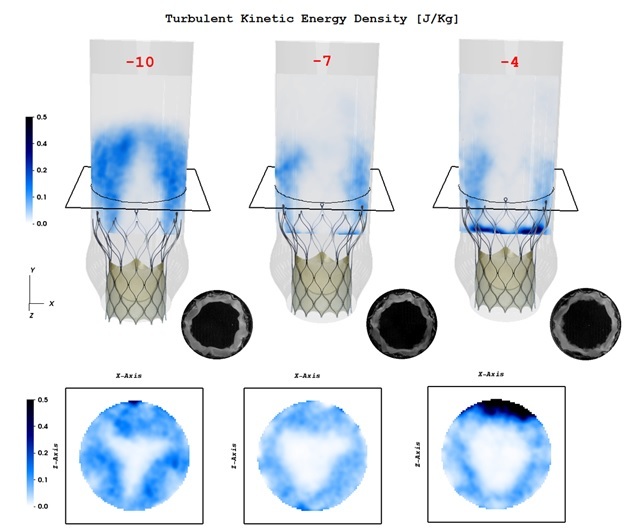 RESULTS: The local Turbulent Kinetic Energy (TKE) density was computed and compared to the Mean Kinetic Energy (MKE). We found that the laminar core of the aortic jet is surrounded by a turbulent region whose intensity increases with lower IH. For IH of -10, -7, -4 mm the total TKE was 20.3%, 12.7%, 10.9% of MKE, respectively. Video frames of the open TAV further indicated that the opening area of the valve was less circular (more corrugated) for lower IH. CONCLUSIONS: IH affects the intensity of turbulent flow in the ascending aorta. For IH=-10mm the TKE nearly doubles compared to IH=-4 leading to higher unphysiological wall shear stresses along the aortic wall. It can be conjectured that reduced expansion of the TAV stent for lower IH leads to uneven (corrugated) opening of the valve cusps triggering flow instabilities and turbulent flow.